Although the page-slug.php feature in WordPress is very helpful, sometimes requiring the theme’s user to use the name you chose for a feature is too difficult or unnecessary. 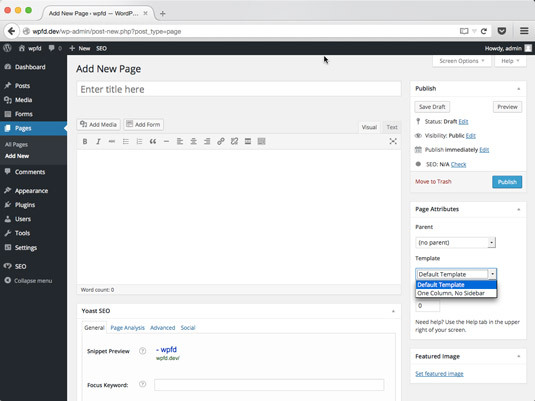 Page templates allow you to create a stand-alone template (just like page.php or single.php) that users can use on any specific page they choose. As opposed to the page-slug.php feature, a Page template can be used on more than one page. The combined features of user selection and multiple uses make Page templates a much more powerful theme tool than page-slug.php templates. * A custom Page template without sidebar. * from a dropdown menu on the edit page screen. This code registers the template file with WordPress as a Page template and adds One Column, No Sidebar to the Template drop-down list found under Page Attributes in the Add New Page (or Edit Page) screen. Using a template on a static page is a two-step process: Upload the template and then tell WordPress to assign the template by tweaking the page’s code. The Add New Page screen on the Dashboard showing page attributes for template assignment. The important part is defining the Template Name between the starting and ending PHP function calls. This tells WordPress to recognize this as a unique template and then include it in the list of available templates within the Page Attributes on the Add New Page screen (it also appears on the Add New Page page). By providing a robust set of Page templates, you can offer your theme users easy-to-use options for formatting different pages within their websites.